Our heating ovens are widely appreciated for their efficiency and long working life. Meta Therm Furnace Pvt. Ltd is one of the renowned Heating Oven Manufacturers In Mumbai. Our manufacturing facility is equipped with all the latest tools and modern technology required to fabricate world-class products, and we utilize it optimally to deliver highly customized heating solutions to our clients. Our Electric Heating Oven is designed to reduce energy consumption considerably and all our clients have appreciated its efficiency in operations. Our products essentially enable you to work with more effectiveness and increase overall productivity. Why Our Industrial Heating Oven? Easy To Maintain - The simple design of these ovens enables easy cleaning and maintenance. Your efforts into maintaining it are as low as possible. Safety - Considering the hazardous aspect of these ovens, we have integrated several features into these units to ensure your safety. Easy To Operate - Anybody can operate these ovens with utmost ease as the system is pretty easy to understand. 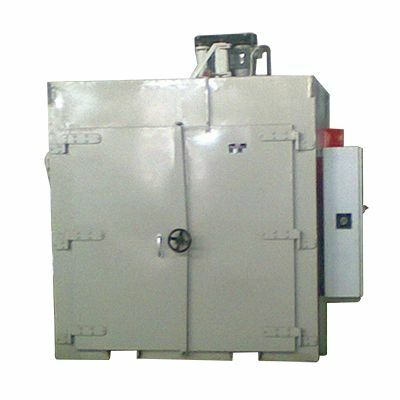 Our company is one of the leading Induction Heating Oven Exporters and Suppliers in India. Get our Drum Heating Oven delivered to your facility with just a click of the button. Click the button for calling.